The interesting city of Potsdam, Germany borders the German capital Berlin and is part of the Berlin/Brandenburg Metropolitan Region. 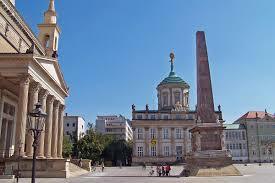 It is the capital of the federal state of Brandenburg. The city is located in a lovely area of lakes and woodlands. 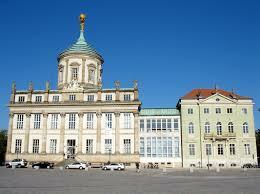 The Prussian rulers built many palaces and gardens and created the architectural style Potsdam Rococo. Today a great deal of Potsdam is protected under UNESCO Palaces and Parks of Berlin and Potsdam World Heritage Site status. Residents and visitors alike take delight in Sanssouci Park, where they can find lots of lovely gardens, impressive buildings and art works. 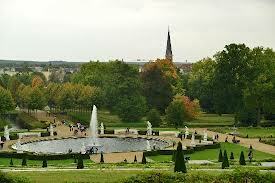 The oldest part of the park dates back to 1744. Highlights of the park include Neptune’s Grotto, one of a series of roundels in the park. This one includes the busts of four Moors. There is also the wonderful Picture Gallery at the Orange Roundel with 17th century paintings among them the art work of Rubens, van Dyck and Caravaggio. The Great Fountain represents the four elements and mythological figures. 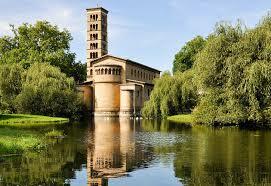 In order to be sure that all of the fountains in Sanssouci Park had enough water the Steam Pump House was built in 1841. 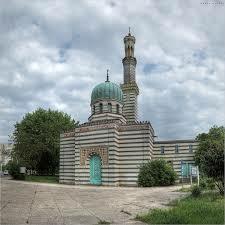 It looks like a Moorish-style mosque with the chimney made to resemble a minaret. Visitors can explore it and during the warmer month can take guided tours in the old steam machinery. There are permanent exhibits about its history. 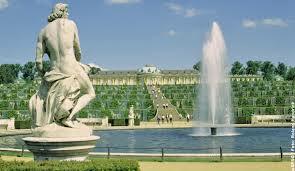 Built in 1745 Sanssouci Palace was designed based on sketches by Frederick the Great. It is an impressive single-story Rococo building with an elliptical dome in the center and circular rooms at each end. The front garden has rich plaster decorations. At the rear is the Grand Courtyard. Among the most notable interior features are the oval Marble Hall, the Little Gallery, with impressive decorations, the Concert Room with large murals, the bedroom and study; the Library with antique busts and the Voltaire Room. Audio guides are available for self-guided tours. 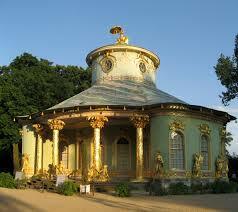 On the grounds of Sanssouci Park is the elegant Chinese House. 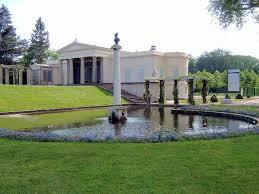 It was created in 1763 for Frederick the Great as a focal point for his flower and vegetable gardens. It has an Asian design with some Rococo influences. Inside are some fascinating features such as stucco marble walls, musical monkeys and a collection of porcelain and murals. Worth seeing is also the nearby Chinese Kitchen and Dragon House, the Orangery with its Raphael Room with copies of 47 art works by the artists and the Sicilian Garden with Mediterranean plants and sculptures. At the east end of the park is The Church of Peace built in 1844. It was modeled after the Early Christian Basilica of San Clemente in Rome, Italy. The greatest treasure here is its apse mosaic dating from 1108, which comes from the Church of San Cipriano, Murano, Italy, purchased and installed here in 1834. 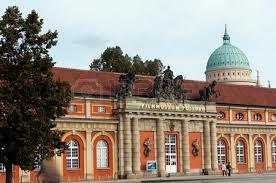 Of interest is also the Kaiser Friedrich Mausoleum, Villa Illaire and Villa Liegnitz, both built in Italian villa style. 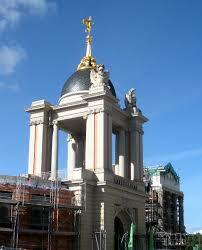 The New Palace was built between 1763-69 from red brick and sandstone and topped with a copper dome. The interior is richly decorated especially in the Marble Hall, the Upper and Lower State Apartments, the Marble Gallery and the Theater. There are many valuable pieced of furniture, pictures, porcelain and works of art. While visiting it is best to take the extended tour which includes a visit to the King’s Apartment. At the rear of the palace are the Communs or Domestic Offices, two brick buildings in Baroque style with columned porticoes and curving outer staircases. Between these two buildings are Corinthian colonnades and a triumphal arc. In front of the palace are the Ancient Temple and the Temple of Friendship. At the Old Market Square you’ll find the former Town Hall, which is now a center for cultural events and activities. It is an impressive Baroque building that was built in 1753 with Corinthian columns, a tower with a stepped dome and a gilded figure of Atlas with the world on his back. 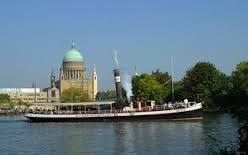 It is also home to the Potsdam Museum with a fine collection of local art, culture and history. To the north of Bassinplatz is the famous Dutch Quarter, with 134 beautiful red brick houses. All of the houses have shuttered windows, gables and white trim. Dutch craftsmen built this area between 1737 and 1742 and it is the largest community of Dutch-style homes outside of the Netherlands. It covers four city blocks and is popular with both residents and tourists. Here you can find boutiques, quaint cafes and restaurants. Of interest is the Johann Boumann House, a museum dedicated to the architect who designed this 18th century building. 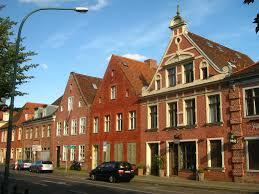 Close-by is Brandenburger Strasse, a pedestrian zone with houses that were build for the billeting of troops. Located in the middle of Market Square is a 16 meter high obelisk with portraits of Knobelsdorff, Schinkel, Gontard and Persius, Potsdam’s great architects. At the back of the square is the entrance to a former castle, Fortuna Portal. Located between Havel River is Friendship Island, which has a playground, an open-air stage, a pavilion with exhibitions and a cafe. It is a great place to relax and enjoy all of the surrounding perennial flower plants, ferns and grasses. It is possible to take a boat trip from the Long Bridge, where passenger ships head for Berlin or to the castles of the Havel River area. Opposite the Old Town Hall is St. Nicholas Church, built between 1830-37. 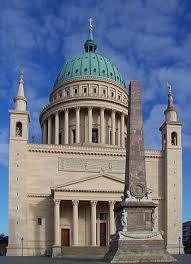 The church was built in the neo-Classical style and is quite impressive with a 77 meter high dome. The church is open for sightseeing and services. In the other large park the New Garden is Schloss Cecilienhof, which was built between 1914-17 in English Tudor style. 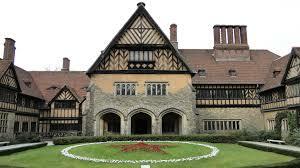 Cecilienhof is the most famous meeting place of the Potsdam Conference which took place July-August, 1945 between the U.S. (Truman), the U.K. (Churchill) and the U.S.S.R. (Stalin) at the end of WWII. The building is well-preserved including the main conference room and many significant artifacts. Take the time to wander in the lovely gardens and view the obelisk in the courtyard. New Garden is located along the shores of the Heilinger See. It was designed to reflect a rural English country estate. One of the highlights is the Marble Palace, a neo-Classical brick building built between 1787-91. Among its notable features are a columned portico on the lake side and a unique pyramid-shaped icehouse. The Film Museum Potsdam has found its home in the 17th century Baroque Marstall, the former Court Stables. The museum regularly screens international and German movies. It also has many fascinating exhibits which are associated with Germany’s rich cinematic history and includes the Babelsberg Studio where many of the country’s movies have been made over the past 100 years. 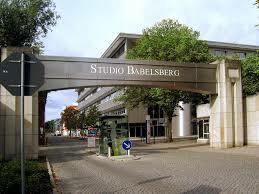 There is also the Filmpark Babelsberg, the world’s oldest film studio and home to a fun film-based theme park. 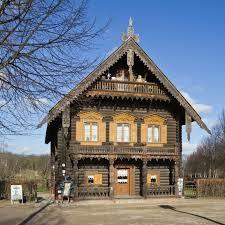 In the little settlement of Alexandrowka the houses were built to demonstrate the close friendship that existed between the German and Russian rulers, Frederick William II and Czar Alexander. The houses were designed based on Russian models and the settlement was created in the form of a St. Andrew’s cross. One of the highlights here is the Alexander Nevsky Church, a Russian Orthodox Church built in 1829 with furnishings from St. Petersburg. 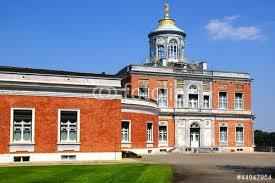 Hunter’s Gate was built in 1733, when the Soldier-King Frederick William I had Potsdam converted to a garrison town. The gate formed part of the city wall, which was used to prevent soldiers from deserting and from smuggling of contraband. When the city wall was pulled down in 1869 the gate remained free-standing. Today it is part of a promenade that was laid out for the 2001 National Horticultural Show along the old city wall path. Einstein Tower was built on Telegrafenberg Hill between 1876 and 1924. 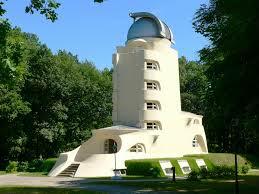 This is the most famous building designed by architect Erich Mendelsohn. Today the tower houses the astrophysical observatory for observing magnetic fields. It is open for tours between October and March and upon request between April and September tours are given of the science park. 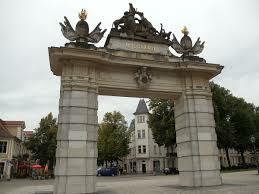 Next to the Dutch Quarter is the large gate known as Nauener Tor and is one of the city’s central meeting places. There are five restaurants here that are very popular during the summer months. The square stretches from the gate and a market selling fresh produce and delicacies is open here twice a week. 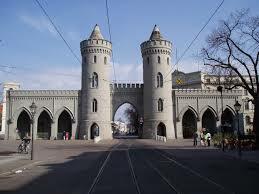 The gate is thought to be the earliest example of the English neo-Gothic style on the European continent. The triumphal arc the Brandenburg Gate is located in the center of the city. It was built when the Seven Year’s War was won in 1770. It is the start of an axis from Luisenplatz to Potsdam’s pedestrian Brandenburger Strasse and up to St. Peter’s and St. Paul’s Church. Secret agents and secret services used to meet at Glienicke Bridge, which connects the state capital of Potsdam with the federal capital of Berlin. It was one of the most renowned monuments of the Cold War up until the fall of the Berlin Wall. Today it is a popular backdrop for commercials and a most wonderful place to take in views of the Schlosspark castle grounds, Babelsberg Castle and park and the Church of the Savior. On the banks of Havel River is Potsdam’s Harbor, right in the center of town. This is where you can find modern passenger ships that offer day trips, round trips and excursions. Among the highlights are seasonal trips to see the magnificent castles of the Hollenzollern dynasty illuminated at night. Visitors can relax at the harbor restaurant “El Puerto” where you can sit under palm trees in the winter and on a Mediterranean terrace in the summertime. I immediately think of the Potsdam Conference. Stalin, Churchill and Truman met here for several days in July 1945, following the end of WWII in Europe. That meeting did so much to shape everybody’s lives, right up to the present day. Plus Potsdam has that bridge where secret agents met. Sounds intriguing. The photos are beautiful. I was lucky. I was stationed in Germany in 1977-1980. A amazing country. we have friends living in a small town near the French border and they say that even though their homeland Latvia (where I live right now) is also lovely they have fallen in love with Germany and it is no wonder.You were lucky to have had a chance to be there.